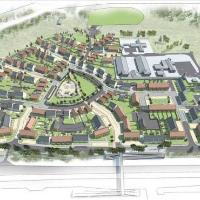 In December 2015 Tetlow King Planning (TKP) secured planning consent on behalf of Spectrum Premier Homes for 210 dwellings and an 80 bed care home in the East Dorset Green Belt on the former St Leonards Hospital Site. TKP acted as the agents on the application for this complex site which included a detailed Environmental Impact Assessment coordinated by TKP, a Construction Environmental Management Plan, Habitats Translocation Plan, Ecological Mitigation Strategy and a Suitable Alternative Natural Greenspace (SANG) Strategy as well as very significant levels of consultation and partnership working with Natural England, Dorset Wildlife Trust, the Forestry Commission, and Highways England as well as East Dorset District Council and Dorset County Council officers. A range of measures were proposed through the application to mitigate any impacts to the ecological and biodiversity designations on site as a result of which TKP secured support for the scheme from Natural England, the Forestry Commission, and East Dorset District Council. The site required access directly onto the A31 and by working closely with Dorset County Council Highways and Highways England the application was also able to proceed with the support of both parties. Support was also secured from the Council’s Architects Panel and was approved unanimously at Committee with no objections from any statutory consultees. The application also included the provision of a 25 ha SANG in the adjacent Hurn Forest to avoid impacts from development upon the Dorset Heathlands Special Protection Area, the establishment of a nature reserve with a long term management plan, a new Cricket Pavilion for the Hospital Cricket Club, and in addition to which 40% of the 210 dwellings were provided as affordable homes. The St Leonards Hospital project involved carefully considered planning and management of a number of other consultants and architects, together with a range of stakeholders many of which had overlapping and/or conflicting requirements for the site. The site itself was constrained not just by its Green Belt designation but also by the fact it contained a sizeable Site of Nature Conservation Importance, a series of Biodiversity Action Plan Habitats, an historically important Oak tree protected by Tree Preservation Order, several species of protected fauna including badgers, bats, dormice and sand lizards and the need to consider the potential for the proposed route of the Navitus Bay renewable energy scheme to pass through the site in a way that caused minimum disruption to residents and the build programme. TKP were successfully able to overcome all of these obstacles in securing an acceptable planning consent for Spectrum within the timeframe required. © Image courtesy of Spectrum Premier Homes and Kendall Kingscott.